Home / SLIDER / Jeeves and Wooster – such fun and frivolity! 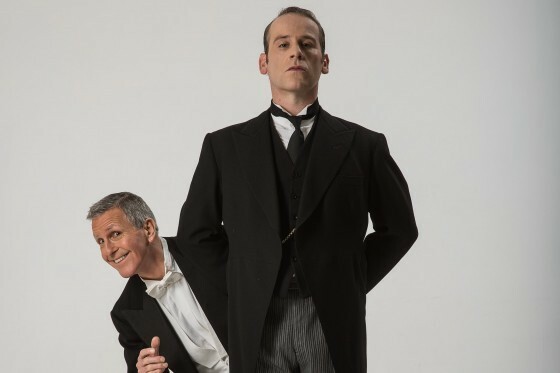 Jeeves and Wooster – such fun and frivolity! Genuine cheers of joyous appreciation show just how much the audience enjoy this evening of warm smiles, loud laughs, frivolity and fun. 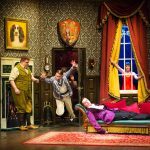 Winner of the Olivier Award for best comedy in 2013, Perfect Nonsense is Robert and David Goodale’s superb adaptation of PG Wodehouse’s work, reworked from their 1993 Edinburgh Fringe contribution. Based mainly on Wodehouse’s 1938 novel The Code of the Woosters, the piece drafts in characters and escapades, all delightfully bonkers, from other works. The Goodales come up trumps, too, in incorporating swathes of the original, sparkling narrative that was Wodehouse’s inimitable forte, while the tour de force (or indeed, tour de farce!) is in presenting the piece as a play within a play. 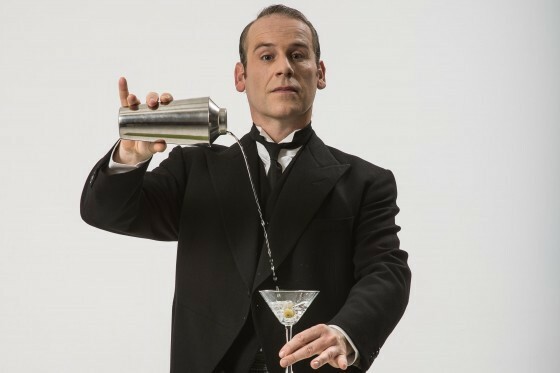 This framework, in which Bertie Wooster illustrates the events he relates by staging them in an amateur production, allows the three original characters – Wooster, butler Seppings and gentleman’s gentleman Jeeves – to people the stage with a host of other eccentrics. 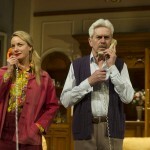 Into the bargain, opportunities abound for physical farce as humour is created all along the way from mishaps and antics (apparently amateurish but actually professionally polished) with props and scenery and in the sound and visual effects departments. 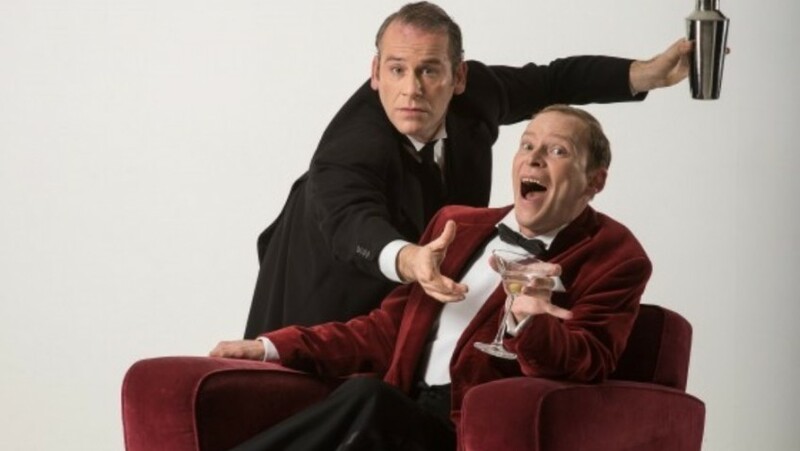 As Wooster, Robert Webb seems less dim, dippy and dependent than some previous Woosters but his performance, professional through and through, is thoroughly enjoyable and brings intimate rapport with the audience. Moreover, his newt impression is exquisite. But though it’s Webb who carries the fabulous narrative and who is pivotal to the many crises and escapades, it’s Jason Thorpe (starting out as Jeeves) and Christopher Ryan (starting out as Seppings) who work up all the sweat. Webb plays Wooster – full stop. Making it look almost effortless, the other two work flat out, multi-tasking with lightning precision as they grab up frocks, wigs, pipes, whiskers, hats and coats to reinvent themselves. Cool, unflappable Jeeves transforms into goggle-eyed, newt-mad Gussie Fink-Nottle, into pipe-smoking, moustache-wearing Watkyn Bassett and into his niece Stiffy (sometimes both at the same time) and (sort of) into daughter Madeleine. It’s not for nothing that Jason Thorpe’s versatility earns loud applause. Seppings, played by diminutive Christopher Ryan, is a wonderful hat-clad Aunt Dahlia, a pot-bellied police constable and, most incredibly, the surreal, gigantic Hitler look-alike that is Reggie Spode. Surprisingly, there’s enough skill and credibility in the transformations that, when one character enters a door, it’s easy to forget that the other can’t possibly still be under the bed! Headlong, barmy plots involving daffy friends and relations, an antique cow cream-dispenser, complicated love affairs and light-hearted blackmail gel interest throughout while knockabout farce and the highly crafted lunacy of stage effects bring one comic bonus after another. From water-pistol rain, an aggressive Aberdeen terrier on a stick, a bicycle-powered revolving stage, and a level crossing routine that almost beings the house down, calculated silliness wins the day. With the outstanding talents of writers and actors combined in unstinting dedication to the craft of comedy, laughter is guaranteed. 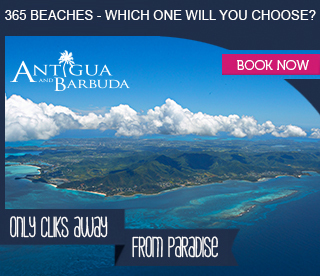 The show tours the country until June. (Those in front stalls may have a slightly restricted view because of the stage within a stage set-up).